Overview Crafted and cultivated for a sensational ride, each Alfa Romeo model at Alfa Romeo Westlake will exceed your expectations. Visit our Alfa Romeo dealership in Thousand Oaks, California today to experience these Italian luxury vehicles firsthand. Located on Thousand Oaks Blvd., our dealership offers an unparalleled selection of new and pre-owned Alfa Romeo vehicles. Test drive the Alfa Romeo Giulia for a sleek, high-performance take on the classic sedan. For an upgraded SUV, check out the nimble and eye-catching Alfa Romeo Stelvio. For a luxury vehicle that captivates the senses, explore the Alfa Romeo 4C Coupe. Come experience the entire family of Alfa Romeo vehicles today at our luxury vehicle showroom. 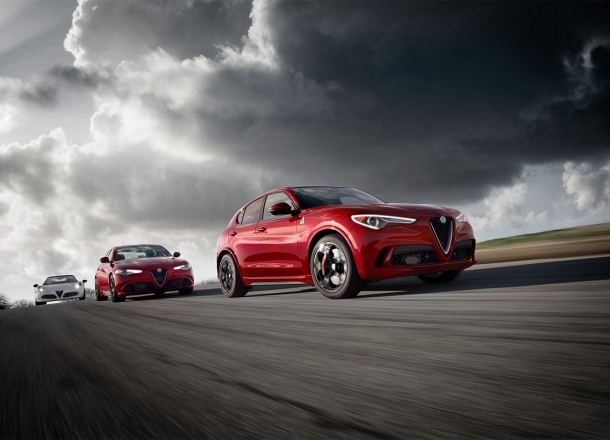 Lease a new Alfa Romeo model at your local Thousand Oaks, CA dealership. Customer service comes first at Alfa Romeo Westlake. Whether you are talking to our experienced sales associates about your favorite vehicles or discussing your budget with our finance experts, you can count on a knowledgeable and respectful interaction at our dealership. We are committed to building relationships with our customers and treating you to a straightforward car-buying process. Visit our Thousand Oaks, CA Alfa Romeo dealership today to find your dream car. Purchasing a luxury vehicle is only the start at Alfa Romeo Westlake. Bring your Alfa Romeo Giulia, Alfa Romeo Stelvio, or Alfa Romeo 4C Coupe to our certified luxury vehicle service center for up-to-date and qualified maintenance and repairs. Stop in for your next oil change, tire rotation, engine diagnostic, and more. Schedule your next Alfa Romeo service appointment today at our Alfa Romeo dealership in Thousand Oaks, CA. We look forward to helping you care for your vehicle!